Why use an editing service? Studies have shown that people are put off from making purchase decisions from companies whose websites have grammar or spelling mistakes. An editorial review eliminates errors and inconsistencies, improves the credibility of your content, and brings further benefits too. There’s a cost associated with not having your web content edited for grammar, spelling and typos. Whether you’ve got an already-live website or content being prepared for publication, you can have us check it for sense, grammar, spelling, punctuation, and consistency – and make sure any embarrassing errors are eliminated. 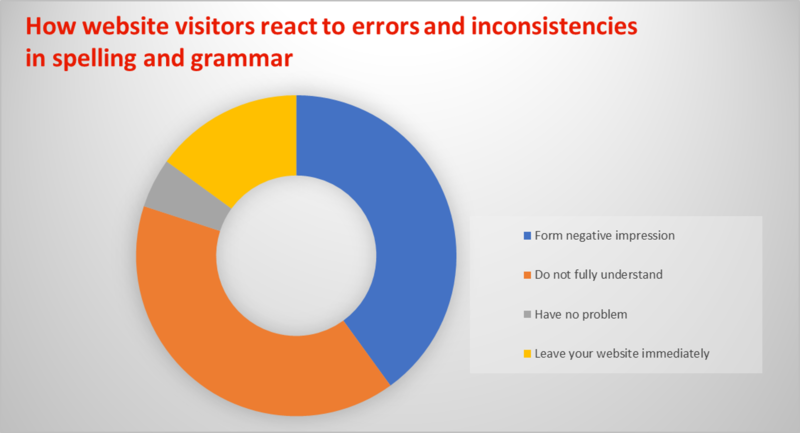 The effect of errors and inconsistencies in grammar and spelling: most website visitors form a negative impression or fail to fully understand the content; some will just leave the site; very few have no problem. Some website visitors – at least a few per cent – will be irritated by errors and inconsistencies and will consciously leave your site for a competitor’s if there are too many of them. Many people will notice errors or inconsistencies subliminally, and will form a vaguely negative impression of your overall trustworthiness. A number of people will fail to understand what you want to say if grammar and syntax errors trip them up and obscure your message, and will thus be less likely to convert. A small proportion of your website visitors will not notice or care if there are mistakes in the text, will understand it perfectly, and will end up taking the action you hoped they would take as a result of visiting your website. Assuming that you want to do business with more than that small proportion of visitors, you might want to consider commissioning a thorough editorial review. Write summaries – it’s a good idea to start each page with a summary of what it’s about, as this helps people and search engines alike to understand in outline the subject of each page so that they can quickly find what they’re looking for. Write metadata – we will write page titles, descriptions and other metadata to make your website more search engine friendly. Check for error messages, button text and form fields – many web pages contain text that’s not obvious until a user comes across it. For example the visible and non-visible labels of a web form and the error message that users see if they try to enter invalid inputs. Advise on rich media – we will review any text associated with video and audio files or tell you if there ought to be text for multimedia files where none exists yet. We can work from a live website or with Word documents, or even use your CMS (content management system) to make direct edits if you’re happy for us to do so and if this is the most efficient way. We can usually give you a firm quote or accurate estimate based on the word count, the format, and the quality of your content.